Believe it or not, sometimes, drawing hands may have more equity in a Holdem pot than a made hand. Of course, this isn't just any drawing hand that we’re talking about. These drawing hands, known as combo draws are special: they have a bunch of outs and thus a high likelihood of actually making a monster hand. Combo draws have at least 12 outs, which makes them so solid that they just have to be played on just about any flop. An example of a massive combo draw is an open-ended straight and a flush draw which has no fewer than 15 outs. A gutshot straight and flush draw has 13 outs too, so that’s another great example. It’s easy to see why these hands are so solid: around a quarter of the deck can hit them for something truly big, something that will simply blow an opponent’s over pair clean away. The worst combo draw, one that comes with only 12 outs, is the gut shot straight flush draw, which will still have more than decent odds against an overpair. This is exactly why good players make a habit out of pushing these hands as hard as possible. Combo draws may be slight dogs against a made monster, but against a hand like an over pair they’re actually favorites. Of course, in order to get the right pot odds for your combo draw, you need to play the hand the right way, which means you need to have waded through a preflop raise, a bet and possibly even a raise on the flop to create the right kind of combo-draw friendly circumstances. When the odds are favorable on the flop, good players get their money into the middle aggressively - after all, that’s what a profitable poker player does: gets as much money into the middle as possible when the odds are good. Shoving all-in on the flop makes a lot of sense from several angles. First of all, as stated above, the odds justify such a move. Secondly, there’s always the chance of a scare-card dropping on the turn, which may get your opponent off the hand and cost you money. Another reason why such a seemingly radical maneuver is justified is the fold equity. 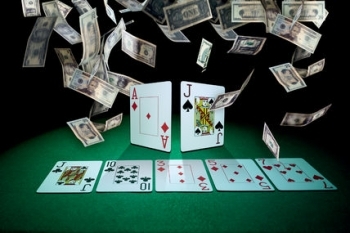 The fold equity is reasonably simple to understand: by being aggressive and by being the one doing the shoving instead of being the caller, our player will secure two ways to win the pot: either by filling his draw and winning it straight up, or by intimidating the opposition and forcing a fold. The caller only has one chance: to make a hand good enough to win. From the above said, it should be clear to you that everything accounted for: the pot equity, the odds and the extra fold equity that you get, combo draws are indeed hands you shouldn’t shy away from playing fast. Add this little trick to your arsenal and you’ll become a better player by it. Extend your aggression to combo draws and rest assured: poker math will have your back. As an online poker player, you should always play with a rakeback deal. You may even want to consider signing up as a poker prop. recruiting poker prop players is something some online poker sites do in order to secure critical player liquidity.